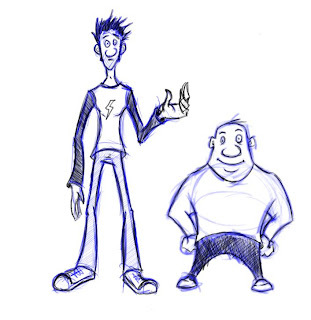 These are some characters I'm working out to animate in Flash. I did this drawing in Sketchbook Pro with a wacom. The pencil tool in that program rocks! I'll post some updates soon, because they are both going to change. I don't quite like the proportions of the skinny guy, and the fat guy looks kind of buff, not fat, so I gotta change the shape of his body.